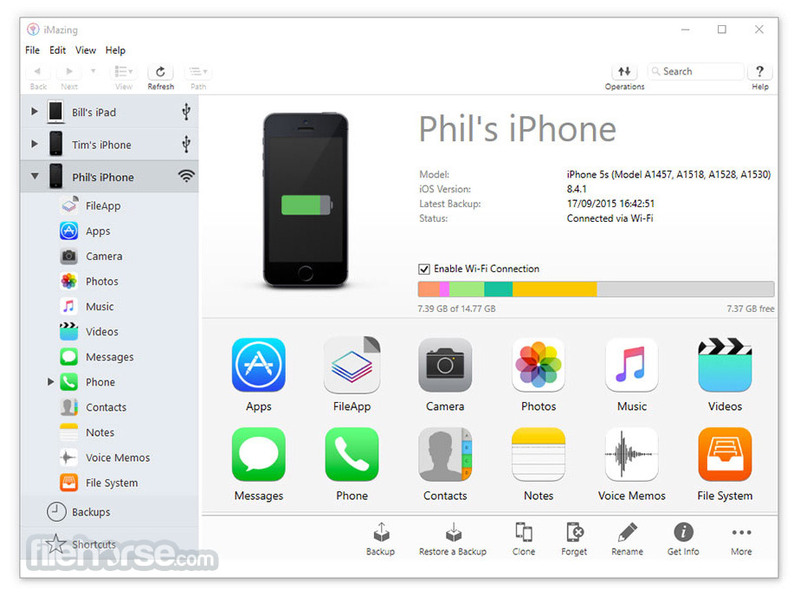 iMazing is the all purpose iOS management software: expand your control over your mobile data beyond what is normally possible, without jailbreaking your device. With iMazing, you can easily browse and manage your backups, extract and print your text messages, or drag and drop songs to your iPhone. To put it simply, iMazing allows you to go way beyond what iTunes offers – see our extensive feature list below. Transfer files between any Mac or PC and any iOS device, works with all app documents, data and media. Connect via super fast USB or via Wi-Fi for hassle free accessibility. No cloud, no jailbreak, no iTunes account or sync required, it just works – even with the all new iOS 9. Backup, restore and clone any iOS device, completely or selectively per data set. Keep complete archives of all your devices, including your applications’ data. Restore them anytime on any device. 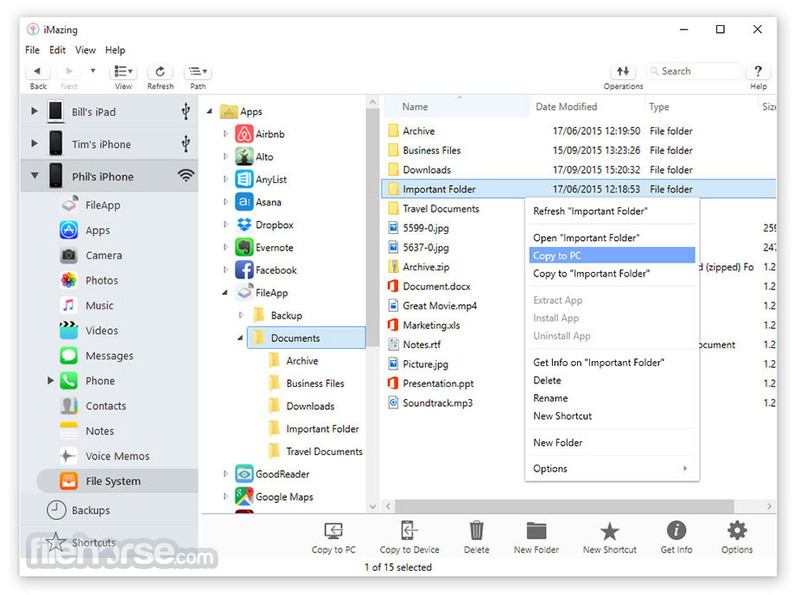 Backup and restore apps or application data (iOS 9) – save space and reinstall applications as you left them, when you need them. Transfer music between any iPhone, iPod or iPad and any Mac or PC. Works both ways, to and from iOS devices without prior sync or iTunes account matching requirements. Handles tracks, albums, playlists and play counts: rebuild your iTunes library as you like. Transfer all iPhone data to any computer: text messages and pictures (SMS, MMS and iMessage), Contacts, Voicemail, Voice Memos, Notes and Call History. Manage iPhone contacts from your Mac or PC: import or export contacts directly ( vCards, Contacts Mac app and Windows Contacts supported ). Copy every picture and movie to your computer, from the Camera Roll, from your Photo Albums, or even from iCloud Photo Streams. Transfer all your iPhone data to a new device running iOS in two super simple steps. Create full backups including media, application data and device settings. In order to preserve disk usage, music and video libraries are handled separately. Restore all data with the click of a button: securely, anywhere and with any computer, independently from iCloud, without any prior sync, no matter the iTunes account linked, it just works. Note: Requires .NET Framework and iTunes. Limited functionality.